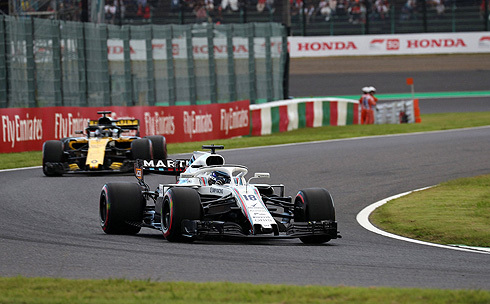 The results for the 2018 Japanese GP would see the Williams Martini team come away with a race of further disappointment. 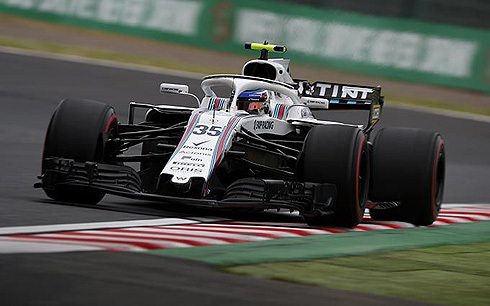 Team drivers Sergey Sirotkin and Lance Stroll would finish well down the order in 16th and 17th, effectively last in the race. It was a race where despite an encouraging qualifying they again struggled for pace in the race. Both drivers would adopt a two stop strategy but this did little to help their situation. 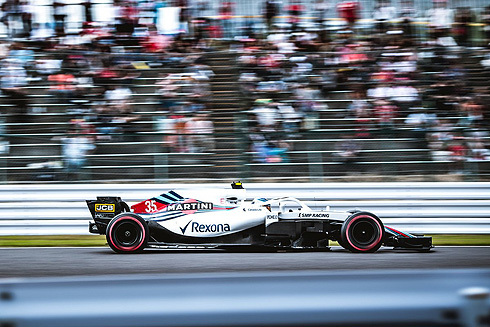 Again the FW41 simply struggled for pace in the race. 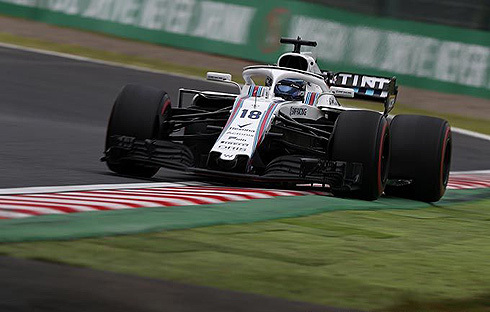 The grid for the fifty three lap 2018 Japanese Grand Prix would see Williams Martini drivers Lance Stroll and Sergey Sirotkin start from 14th and 17th positions respectively. On pole was Hamilton from Bottas, Verstappen, Raikkonen, Grosjean, Hartley, Gasly, Vettel, Perez and Leclerc in tenth. Of the top ten the Mercedes and Grosjean would start on the used soft tyre while Leclerc was able to start on new soft tyres as he moved forward due to grid penalty for Ocon that would see him start 11th. The rest of the top ten would be on supersoft tyres. Both Williams would start on new soft tyres while those outside the top ten were also on this tyre except Hulkenberg who was on the medium. The grid would complete their formation lap and return and with the lights going out it would be Hamilton leading with Vettel getting up to sixth. Bottas was second and Verstappen third. Raikkonen was fourth while Vettel would get past Grosjean for fifth. For Williams lance was running in 16 and Sergey 17th. Verstappen would make a mistake at the first chicane seeing him make contact with Raikkonen seeing Vettel passing his team-mate as a result. There would be contact between Magnussen and Leclerc that would see the Hass driver get a left rear puncture. Ericsson would get past Sergey for 17th seeing the Williams now 18th. Magnussen would complete a lap with the rear tyre creating debris around the track. he would pit coming back out a lap behind on the medium tyre. The Safety Car would be deployed no doubt due to the debris from Magnussen's car. The incident between Verstappen and Raikkonen was under investigation. Leclerc would pit on lap six joined by Sergey. Sergey would change to the medium tyre. Leclerc's pit stop was the change a damaged front wing and switch to the medium tyre. Lance was now running in 15th behind Hulkenberg. Verstappen would be given a five second timed penalty for not returning safely. The Safety Car would come in on lap eight and it would be Hamilton leading from Bottas and Verstappen. The Williams drivers were running in 15th and 17th. Sergey would get past Leclerc for 16th at the restart but the positions would be reversed. Vettel would try to pass Verstappen at the Spoon curve but the pair would make contact seeing Vettel would spin dropping to the rear of the field. This incident was under investigation with the Williams pair 14th and 16th. Lance was still running on the soft tyre with eleven laps completed. Magnussen would pit to retire while Vettel would continue to run moving up to 17th. At the front Hamilton was leading Bottas by 2.2 seconds with Verstappen third followed by Raikkonen, Ricciardo, Grosjean, Gasly, Perez, Ocon and Sainz tenth. Vettel would get past Lance seeing him now 16th and Sergey 18th. Lance would pit taking on medium tyres and would return in 19th seeing Sergey now 17th. Lap twenty and Raikkonen would pit dropping to ninth but now on the medium tyre. Vettel was now up to 12th behind Hartley. Ricciardo was now in fourth followed by Grosjean and Gasly. Verstappen would pit taking his penalty and dropping to fourth. Bottas and Ricciardo would pit on lap twenty four seeing the order now Hamilton with Bottas still second followed by Verstappen, Ricciardo, Raikkonen, Grosjean, Gasly, Ocon, Sainz, and Vettel tenth. It was confirmed that Lance would get a five second penalty for causing a collision at the re-start. Sergey was running in 16th and Lance 18th with twenty seven laps completed. Vettel would pit on lap twenty nine taking on the soft tyre seeing him 16th. Sergey was now 15th having been behind Ocon but Sergey would get back ahead now in 14th but again the positions would change with Sergey dropping to 15th. Lance was running in 17th. Vettel would move past both Williams with Sergey and Lance now 16th and 17th but with Hartley pitting they would move up to 15th and 16th with Sergey still ahead of Lance. Hamilton had also pitted changing to the medium tyre and retaining his lead. 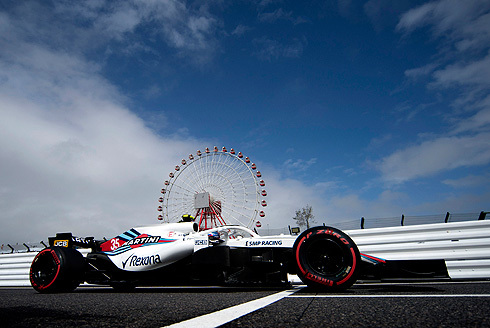 The Williams drivers were able to move up to 14th and 15th as a result of a pitstop by Hulkenberg. Vettel continued to move up and on lap thirty four he was eighth. Sainz would pit on lap thirty four dropping to 14th. This would see Sergey move up to 13th while Lance continued to run in 15th. Sainz would get past Sergey with the Williams drivers now 14th and 15th. Vettel was now in sixth but was now 40 seconds behind his team-mate Raikkonen in fifth. Hartley running on the soft tyre would get past Lance for 15th. Hartley would also gte past Sergey for 13th seeing the Williams drivers now 14th and 15th. With the pit stops completed Alonso would get past Lance taking 15th and was close behind Sergey and would pass seeing the Williams drivers now 15th and 16th. Sergey would pit on lap forty taking on new supersoft tyres with Lance also coming in the next lap also taking on new supersoft tyres. They were now running in 16th and 17th and behind both McLaren's. The Williams pit stops would take place under the Virtual safety Car as Leclerc's car was removed after he stopped with an issue at Turn ten. The final laps would wind down and it would be Hamilton who would take victory from Bottas, Ricciardo, Raikkonen, Vettel, Perez, Grosjean, Ocon and Gasly tenth. The Williams drivers would finish in 16th and 17th and last. Again the Williams drivers suffered from a lack of pace come the race. Even if they qualify well they just seem to go backwards with a lack of pace. This would most likely not be something that will change for the last races of the 2018 season.